I couldn’t resist the title. 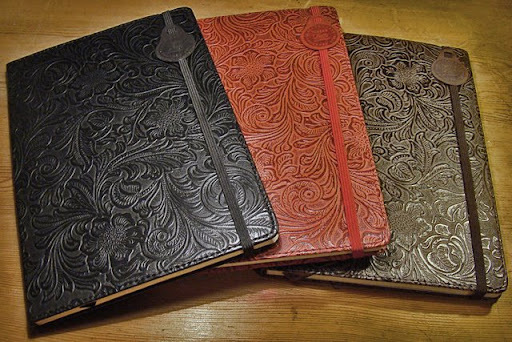 I bought four Letts of London baroque notebooks (A5) today – two black, one red an one brown. Since I didn’t even know that they existed in A5 and the store had an offer – 4 for the price of 3 – I couldn’t help myself. The paper seems so smooth and nice and cream coloured. One odd thing is that only every odd paper is lined – the other are blanks. I don’t think I have seen that before. I haven’t more than doodled a little in one of them, but I think I dare to say that it is more fountain pen friendly than Moleskine (the feathering is a disaster) and prettier – and maybe more fountain pen friendly – than Letts regular linen bound and the old style 80g Rhodia web notebook. I really like this flower-faux-alligator-bonded-leather pattern. It measures 21*15 cm, has an inner pocket (I love to stuff notes and postcards and unfinished letters there) and a rubber band. Very nice new acquaintance. I think I’ll try it out properly tomorrow. Unfortunately I think it is a kind of Limited Edition. I really dislike the LE concept. If I like things I want to be able to buy them even after a limited time and if I don’t like them I don’t buy them anyway. Even toothpaste comes in LEs here. Silly silly silly. This entry was posted in fountain pens, paper, writing and tagged fountain pens, letts, moleskine, notebooks, paper, pens, rhodia, writing. Bookmark the permalink. These are lovely! More FP friendly than the Rhodia webbie? Really? I’m sorry – I should have written that they are better than the old 80g version of Rhodia – I’ve edited that now. I have not had the opportunity to try the new 90g version yet – this is such an undeveloped country when it comes to PIP – Pens Ink Paper. I’ll try to make a proper test of Letts Baroque soon.